You choice! Choose from any 16 oz. flavor of pickle, salsa or relish!Please check the individual flavors for ingredients list. From Gregory Martz of San Clemente, California on 4/11/2019 . 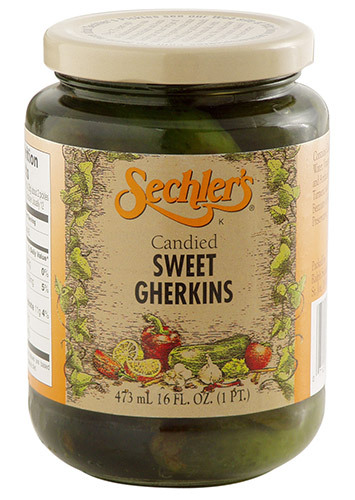 I have been buying these pickles (Sechlers) for over 20 years! Some of the best pickles I have ever tasted, especially the sweet/dills! Magnificent!! From Elizabeth Kezman of virginia Beach, Virginia on 3/21/2019 . I love these pickles I have sent them to friends as gifts. They all love them too. The salsa also great . From John Trytten of Chicago, Illinois on 2/15/2019 . These are just the greatest pickles. Don't understand why they aren't in all the stores. But their delivery is super fast. Just munching away happily, a big smile on my face. From Don of Snellville, Georgia on 2/3/2019 . These are the best candied sweet pickles ever. I use to buy a store brand in grocery store, but they discontinued, and these are even better and much fresher. After shipping, they aren't the cheapest, but they are the best. I have ordered from a third party before, but these were packaged and shipped must better, and at about the same price. I will certainly be buying from here in the future. From Tonya Henry of Redmond, Washington on 1/17/2019 . This is a great way to sample many of the fine products. I haven't found one yet that I didn't like.